U.S. security concerns may still haunt the reputation of Huawei Technologies, but the Chinese company's elusive founder brushed off any involvement in state-sponsored cyber espionage in a rare interview on Thursday. "We are a Chinese company, but we will never hurt another country," said Ren Zhengfei, in an webcast interview at the World Economic Forum in Davos. 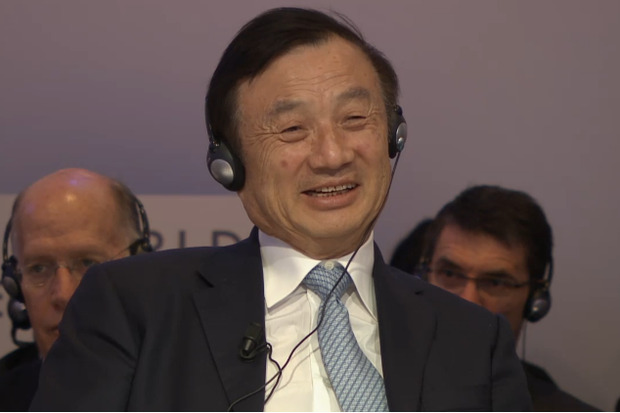 Appearing relaxed and smiling at times, Huawei's founder tried to dispel misconceptions surrounding the Chinese company, which over the years has found itself embroiled in cyber security concerns coming from the U.S. government. In October 2012, a U.S. congressional committee declared Huawei a security threat because of its alleged ties to the Chinese government. Not helping the matter was Ren, who rarely gives interviews and has earned a reputation as a mysterious individual. Since then, however, Ren has been making himself a little more available, and on Thursday he answered questions from journalists on the company's business, and his stance on cyber espionage. Huawei, which has risen to become a major provider of networking gear, simply builds "the pipes" to power the Internet, Ren said. "Why would I want to take someone's data? Who would give me money for it?" he asked. "We just do the iron coating to the pipes. What else can this iron coating do? This iron coating is simple-minded. Huawei is also simple-minded." Ren added that Huawei had never received a request from the Chinese government asking it to spy on the U.S. In fact, when the company had received a security audit from the U.K., the country's government complained that the Huawei's security measures were "naive," Ren claimed. They went on to conclude that Huawei was incapable of supporting any cyber espionage. "You're not even aware about these wiretapping things, you're own networks aren't even secure," Ren recalled the U.K. authorities stating. Ren also addressed his reputation as a mysterious founder, and said people expect too much of him, believing he knows everything about Huawei's business. "I don't understand technology, or finances, or management," he said, describing his role as simply a passenger on board a driving car. "They think I'm responsible for it all, but if you ask me a question, I won't be able to give you an answer." Huawei, founded in 1987, has grown to become one of China's largest technology firms, and produces smartphones and enterprise systems in addition to its networking equipment business. U.S. officials, however, have feared that its networking gear could contain secret surveillance equipment from the Chinese government. Ren himself served as an engineer in China's People's Liberation Army before retiring in 1983. In response, Huawei has always denied any ties to the Chinese government, and insists it is a private company. Despite the security claims against Huawei, the Chinese company received some vindication later, when former U.S. National Security Agency contractor Edward Snowden leaked that the U.S. government had been secretly spying on China. This allegedly included creating backdoors into Huawei products, and even spying on Huawei executives. On Thursday, however, Ren said that he felt the U.S. had never treated Huawei poorly. He even hopes his company can learn from the country on how to achieve greater "openness." Many still misunderstand Huawei, thinking it had inside help to achieve its growth, or represents a business threat, he added. "But as long as we work hard, our identity will be proved."